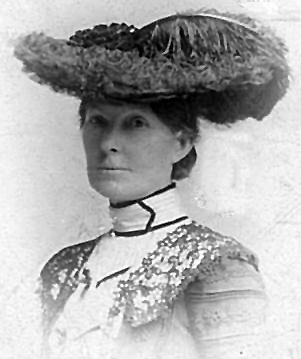 IT BEGAN with a picture of an attractive lady with a striking hat, taken by a Helensburgh photographer. I came across the photo, and on the back it gave some clues: the name Mrs Snell Anderson, the date Christmas 1903, and the address Dalmeny. The challenge to find out more about someone with such an unusual name was irresistible, and revealed a flavour of town life in that era. The photograph was taken by W.D.Brown & Co., Photographers and Miniature Painters, of West Bay Studio, 109 West Clyde Street, Helensburgh’s leading photographers of the period. They specialised in 'Artistic Portraiture at moderate prices', including 'Child Studies', and later became M. & J.Brown. A Google search for Mrs Snell Anderson led to the Helensburgh Directory of 1899, and the discovery that Mrs W.Snell Anderson was treasurer of the burgh’s Cottage Home for Convalescent Children at 18 Glasgow Street. It also showed that she lived at Dalfruin, 1 West Montrose Street, until Whit Sunday 1900. So where did Dalmeny come in? It would seem that this was a mistake by the photographers, as a search for her husband — clearly a man of means — revealed that he employed well known architect Robert Wemyss to build Kilmeny, 6 Munro Drive West, for him, starting in 1899. Today this mansion is called Strathmoyne. It was time to turn to that old faithful, the Scotland’s People website on which, for credits which have to be bought, old records of births, marriages and deaths, also census records, can be searched. It took quite a few credits, but thanks to the unusual name Snell, details of Mrs Snell Anderson began to emerge. She was born Mary Isabella Smith, the daughter of a merchant who lived in Leith, and she was living in Liverpool when she married William Snell Anderson, at that time an iron merchant who lived in Partick, at Cockpen, Midlothian, in 1880. William, the son of coalmaster James Anderson and his wife Janet Snell, was 29 at the time, and his wife two years older. I could not find any evidence of them having any children. The 1881 census showed that they set up home in Cumbernald, and a few years later they moved to Helensburgh. They were at Dalfruin at the time of the 1891 census, and William had become an insurance broker. Next came the move to Kilmeny where they lived for the rest of their lives, William dying of heart disease in the house on December 20 1931 at the age of 80. The death certificate described him as a retired marine insurance broker. The town directories of the period reveal a long list of organisations, many to benefit others, which Mr and Mrs Anderson might have belonged to. The Young Woman’s Christian Association met in the Good Templars Hall every Monday evening, while the Association for Improving Condition of the Poor met in the East Princes Street Mission Hall at 11.30am on Thursdays. The Regions Beyond Helpers Union was chaired by Sam Bryden, later to be Provost, and he was also secretary of the Helensburgh and District Nursing Association, whose hon president was Lady Colquhoun of Luss and whose president was the Provost, Colonel William Anderson. The Helensburgh Domestic Mission had its own Superintendent and Bible Woman, there was the Helensburgh Town Mission with its own Missionary, while Sam Bryden turned up again as a Vice-President of the Helensburgh Sabbath School Union. Miss Kidston of Ferniegair was President of the Colportage Society for the Parishes of Rosneath, Row (Rhu), and Cardross. This was another religious society, whose travelling evangelists would preach to large crowds in all sorts of venues, including on the beach. Religious stories would be told to parents and children, singers would perform, then speakers would relate more Bible stories with the aid of a large book of pictures. Sir James Colquhoun of Luss was President of the Helensburgh and Gareloch Auxiliary to the National Bible Society of Scotland. There was a Helensburgh Mission Hall Association, and a Penny Savings Bank was also in operation. There were three public companies, the Helensburgh and Gareloch Provident Investment Building Society, the Helensburgh Cemetery Company, and the British Workman Public House Company Ltd. The three banks were the Bank of Scotland, Clydesdale, and Union. Friendly societies included the Helensburgh Grand Lodge of Oddfellows, the Helensburgh Lodge of Loyal Independent Order of Oddfellows, the Helensburgh and Gareloch Lodge of Ancient Shepherds, the Sir James Colquhoun Lodge of Juveniles Shepherds, the Gareloch Lodge of Free Gardeners Friendly Society, and the Irish National Forresters. The list ends with Sons of Temperance, Helensburgh Division, No.864, led by Worthy Patriarch John Morton. Sporting clubs included several still in existence today — but Helensburgh Ladies Cycling Club is no more. Literary activities included the Church of Scotland Lectures, whose chairman was the Rev John Baird, father of TV inventor John Logie Baird, the Helensburgh Naturalist and Antiquarian Society, and the Larchfield Literary Society. Add in several other societies devoted to temperance and abstinence, and it was a really busy burgh even in those days!